Happy May Day. Lots to do today at the homestead in Austin. All manner of yardwork, cleaning, picking up kids, and baking of course. This week, I had a few people ask me what my pie of choice was going to be for week number twenty three. I didn’t have a plan for this one. Actually, generally speaking, my planning has fallen by the wayside. I usually scramble on the weekend figuring out the pie, and then rushing to the store to get any missing ingredients. Not really my preferred method but it works well enough. This pie comes courtesy of cooks.com. The pie guru who created this recipe is one Sherry Monfils. Why thank you! Blend the flour, butter, sugar and salt in a food processor using on/off turns. Add 3 tablespoons of water and mix until moist clumps form. Add additional water by teaspoon if the mix is dry. Remove from processor and form into a ball. Flatten and wrap in plastic wrap. Let set in the fridge a minimum of 3o minutes. Preheat the oven to 400 degrees and remove the dough after half hour. Roll out on lightly floured surface into a 13 inch circle. Transfer to a 9 inch pie dish. Today I rolled up the dough in a log and unrolled it in the pie dish. It actually worked pretty well. Trim the dough and use the remnants to patch any holes you might have around the crust edge or in the dish. You aren’t supposed to bake the crust but I did. It was a slight oversight. I lined the bottom of the crust with foil and filled with uncooked beans to weigh it down. It was baked for 20 minutes. After it was baked, the beans and foil were removed and the crust allowed to cool. Preheat oven to 400°F. In a bowl, combine sugar, 1/3 cup flour, eggs, sour cream, and vanilla until smooth. Toss in blackberries and stir well. Spoon into pie shell. If you’re someone who decides to bake the pie crust when you aren’t supposed to, drop the oven rack to the lower third of the oven, and put an aluminum foil collar around the crust so it doesn’t burn.Bake 30-35 minutes or until set. In a bowl, combine 1/3 cup flour, brown sugar, pecans and soft butter, mix well. Sprinkle over pie. Return pie to oven for 10 minutes. Let cool and slather with lots of whipped cream! The pie tastes good. I like the contrast with the berries, the crumble and the flakey crust. Thumbs up on this one. 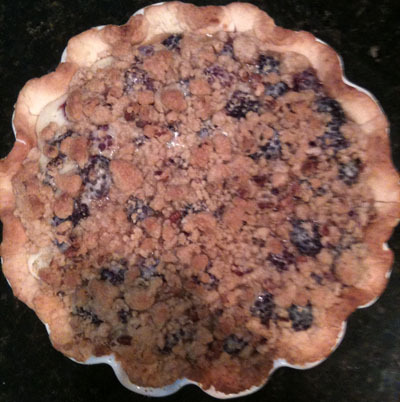 This entry was posted in Blackberry Pies, Cream Pies, Homemade Pie Crust Pies and tagged Baking, blackberry, cream cheese, Dessert, Pie, Recipe by pieofthebeholder. Bookmark the permalink.